This Long Dress is full of grace and looks trendy with its cut sleeves. It is made from the finest variety of cotton printed fabric which is comfortable as well as stylish. These are available in the market as per the requirements of our customers. which gives a unique look and style. Comfortable to wear, it enhances the beauty of the wearer. Providing a rich look and flow, these are available in ethnic as well as in contemporary designs. We are a trusted name of the industry engaged in offering a comprehensive range of excellent quality Indo Western Stylish Designer Long Printed Party wear Kurtas Dress. Our fine and delicate weaved fabrics are tested for the tear strength and shrink Resistance before being designed to perfection. The sophisticated warehousing are necessary for longterm storage and safe delivery to the clients. We offer varied payment mechanism and shipments to reduce cost of final good.This evening dress is full length and elegant. It features adjustable drawstring which can be tied to front neckline for comfortable fit. We are listed amongst the leading organizations, engaged in offering excellent quality Ladies Fashion Top Tunic Kurti. The offered range of top tunic kurtis is hugely acclaimed among clients for its striking patterns, attractive designs and stylish look. Further, to meet the diverse requirements of the client, we are offering these tunics in many attractive designs, patterns, prints and colors. 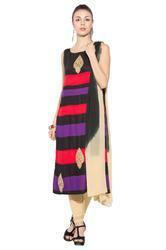 Ladies Kurta Kurti Top Tunic of Varied price order and design patterns. Our fine and delicate weaved fabrics are tested for the tear strength and shrink Resistance before being designed to perfection. Due to their latest designs, attractive patterns and beautiful colors, these tunics can be worn at both casual and party occasions. Indo Western Designer Tunics. Our fine and delicate weaved fabrics are tested for the tear strength and shrink Resistance before being designed to perfection. The sophisticated warehousing are necessary for longterm storage and safe delivery to the clients. We offer varied payment mechanism and shipments to reduce cost of final good. We offer Designer Cotton Kurtis are a very good choice for any occasion. Fine fabric is used to manufacture designer Kurtis/Tunics. Delicate and intricate designs in designer kurtis adds an elegant and special touch to the outfit.This kurtis glorifies look of the wearer. Due to their latest designs, attractive patterns and beautiful colors, these tunics can be worn at both casual and party occasions. We Offer Stylish With Trendy Look Designer Long Kurta With Pleasant Colors.This evening dress is full length and elegant. It features adjustable drawstring which can be tied to front neckline for comfortable fit. We offer wide variety of exclusive Designer Kurtis/Tunics to suit the personality of the individual.It is a perfect choice to be wear on formal as well as informal occasions.Our Kurtis fabricated using superior quality cotton fabric, it provides maximum comfort with a distinguished look. We are offering high range of ladies Designer Cotton Kurtis. Our Kurtasare available in exclusive designs and are applicable for casual or formal wear. We presents these Tunics in various designs and color combinations. Tunic 100% cotton tunic We are engaged in offering a wide array of alluring range of Western Wear at industry leading prices. Our garments are made by adept designers using quality fabric material and latest technology & machinery. We design our products as per the latest trends and requirements of our customers. This Tops Western dresses in casual, and semi formal events. Modern technologies has modified the style and designs. attractive designs and stylish look. Further, to meet the diverse requirements of the client, we are offering these tunics in many attractive designs, patterns, prints and colors... We offer Designer Cotton Tunics in various kind of beadwork, embroidered work etc., that makes our collection popular amongst people across the globe. These Tunics are unique in look.